Glad Tall Kitchen Drawstring Bags are made strong and durable to help prevent trash disaster in the home. 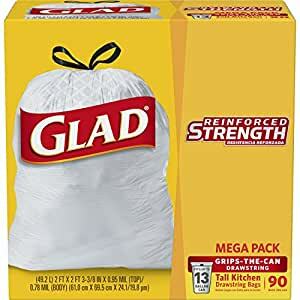 These kitchen garbage bags are guaranteed strong with reinforcing strength bands that make the trash bags stronger while using less plastic, when compared to a leading branded bag. They are reinforced at the top, middle and bottom. These drawstring bags are made with a unique diamond pattern that stretches around objects to prevent rips, reinforcing bands to add strength plus a thicker plastic for leak protection. The strong 3-layer drawstring closure makes trash removal easy to lift, carry and toss away. Simply pull up on the drawstring to close the trash bag and then knot the drawstring for extra security. The 13 gallon size is perfect for use in the kitchen and other areas throughout the home. They are also great for seasonal cleaning needs like Spring Cleaning and Back to School. Get a handle on trash with Glad.Do not use for food storage.